What are the points to be covered? What is line to line fault? How line to line fault occurs? Fault current in line to line fault. 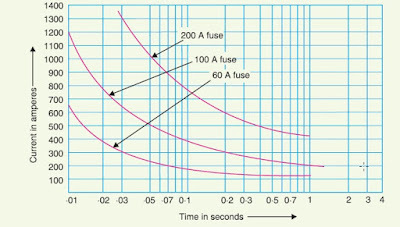 Calculate line to line fault current. What is Meant by Line to Line Fault ? When two conductors of a 3 phase system are short circuited line to line fault or unsymmetrical fault occurs.This fault is severe compared to symmetrical faults in power system.In order to safeguard power system network analysis of unsymmetrical faults (in this case line to line fault) must be done. Note :: From above steps it is clear that the line-to-line fault the zero sequence component of current I0 is equal to zero in line to line fault. 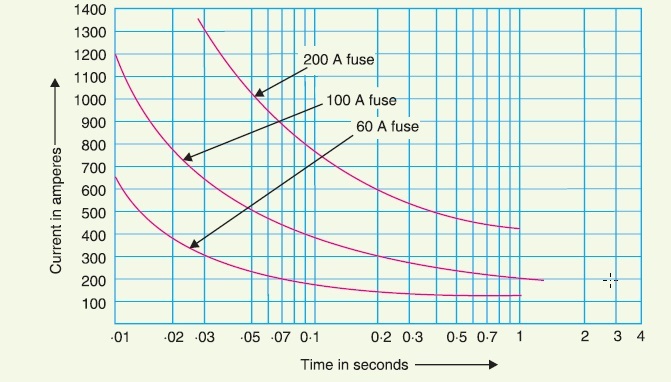 Above what is line to line fault and how to find line to line current fault current are discussed. In modern power generation, transportation, distribution we use poly-phase system over single phase system.In poly-phase AC system it might be two , three or more individual circuits, operate at same frequency, their voltages and currents are out of phase from one another.But when it comes to practical scenario three phase system considered as poly-phase system.It is most reliable and efficient compared to all poly phase systems.Single phase system has some limitations and drawbacks so it's been replaced by three-phase system.Here we listed out major reasons why 3 phase/poly-phase system is better than single phase system. 1. A polyphase/3 phase transmission line requires less conductor material than a single phase line for transmitting the same amount power at the same voltage. 2. For a given frame size a polyphase/3 phase machine gives a higher output than a single-phase machine. For example output of a 3-phase motor is 1.5 times the output of single-phase motor of same size. 3. Polyphase/3 phase motors have a uniform torque where most of the single-phase motors have a pulsating torque. 4. Polyphase/3 phase induction motors are self-starting and are more efficient. On the other hand single-phase induction motors are not self-starting and are less efficient. 6. Per unit of output. 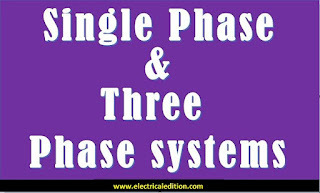 the polyphase/3 phase machine is very much cheaper. 7. Power factor of a single-phase motor is lower than that of polyphase motor of the same rating. 8. Rotating field can be set up by passing polyphase current through stationary coils. 9. Parallel operation of polypahse alternators is simple as compared to that of single-phase alternators because of pulsating reaction in single-phase alternator. 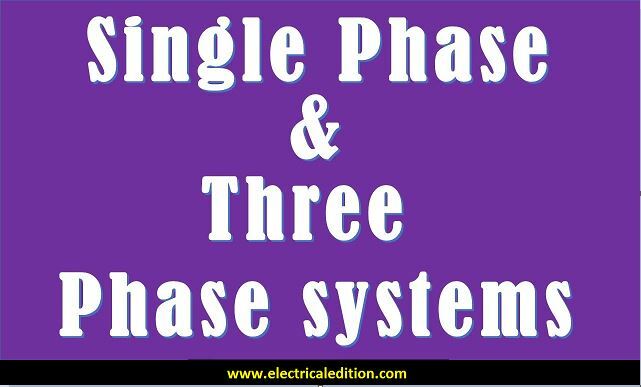 It has been found that the above advantages are best realized in the case of three-phase systems.Consequently, the electric power is generated and transmitted in the form of three-phase system. Single Phase induction motors are not self starting as it does not have starting torque. Three phase induction motors are self starting. Parallel operation is not easy. Parallel Operation is easy. Efficiency of single phase motor is lesser. High efficiency. Single phase motors have pulsating torque. Three phase motors have uniform torque. Single phase motors have lower power factor. Three phase motors have higher power factor. What is a bus bar? A bus - bar is a conductor or group of conductors and it collects electric energy from incoming feeders and distributes them to outgoing feeders. So bus - bar is a junction where all incoming and out going currents meet. Bus - bar is generally made up of aluminium but not with copper because aluminium has special characters like higher conductivity, lower cost, excellent corrosion resistance, etc. 2. Position of a substation in the system. 6. Availability of alternative arrangements if outage of any of the apparatus happens. 7. Bus - bar arrangement should be simple and easy to maintain. 8. In case of load - growth there must be possibility to extend the system to meet the load requirements. 9. The installation should be as economical as possible, keeping in view about the needs and continuity of supply. 2. Single bus-bar arrangement with bus sectionalized. 4. Double bus double breaker arrangement. 5. One and a half Breaker arrangement. 6. Main and transfer bus arrangement. 7. Double bus system with bypass isolators. Let us see each of bus - bar arrangements in detail now. Note: Through outgoing feeders power is supplied to loads. This single bus - bar arrangement consists of only one bus - bar and all the incoming feeders and outgoing distributors are connected to this bus - bar only. 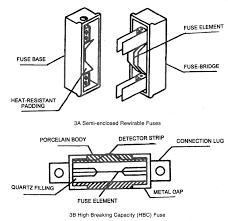 All the fuses, circuit breakers, generators and transformers are connected to this as shown in the following figure. 1. It is easy in operation. 2. Initial cost s less. 1. When damage occurs then there will be whole interruption of power supply. 2. Flexibility and immunity are very less. 1. As we are using circuit breaker to divide a bus - bar into two sections fault on one section will not interrupt power supply on the other section only few loads will have lac of power supply. 2. The fault level can be reduced by adding a current limiting reactor. 1. We are using extra isolators and circuit breakers so that the cost will be high. We have a bus coupler breaker which is used for bus transfer operation. When we need to transfer load from one bus to other bus we need to close the bus coupler first and then close isolators of the associated bus to which load is to be connected and open the isolator switch coupled to fault bus and then open the bus coupler breaker. 1. It has greater flexibility. 2. During fault conditions there is no interruption of power supply to load. 1. We cannot transfer load from one bus to other bus without interruption of power supply for few minutes. Here we energize both the feeders and divide feeders among both the buses but we can connect desired feeder to desired bus at any time for this purpose we need to close the isolator and then circuit breaker associated with the required bus - bar and later open the circuit breaker and then isolator from which is has to be disconnected. 1. During fault conditions load can be transferred to one bus so there will not be interruption in power supply. 2. Here we are not using a bus coupler so there will not be much delay in power supply while closing circuit breaker to transfer load from one bus to other bus. 1. The number of circuit breakers used are high so cost is very high. 2. Maintenance cost will also be high. So this type of arrangement is used very rare. 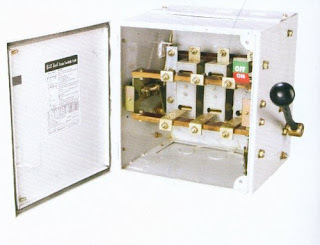 During normal conditions all the three circuit breakers are closed and the both circuits operate in parallel and power is fed to feeders from the two bus - bars. If fault occurs on one bus bar then with the help of second bus - bar feeder circuit breaker and tie breaker power is fed to feeders. This means each feeder breaker has to be rated to feed both feeders which are coupled by tie breaker. 1. There will be no interruption of power in case of fault because all the feeders can be transferred to other healthy bus immediately. 2. Additional circuits can be easily added to the system. 3. Cost is less compared to double bus double breaker arrangement. 1. This arrangement is complicated because during fault two circuit breakers are to be opened. 2. Maintenance cost is high. In normal conditions the feeders are fed through main bus but during fault conditions load is transferred to the transfer bus. In order to transfer load from main bus to transfer bus we need to close the bus coupler first and then close by pass isolators of feeder to be connected to transfer bus and open the isolator switch of feeder coupled to main bus and then open the bus coupler breaker. 1. No interruption of power supply because in case of fault load can be shifted to transfer bus. 2. Load can be divided into two groups since they can be feed from either of the buses. 1. Two bus - bars are used which increases the cost. A bus coupler is also provided so while transferring load to healthy bus close the bus coupler breaker first and close the isolator of feeder to which it has to be transferred and open the isolator switch of feeder coupled to fault bus and then open the bus coupler breaker. 1. cost is high as we are using two bus bars and extra isolator switches. Here if one circuit beaker is damaged it is opened and the feeder can be supplied from the other circuit breaker which is near to it. 1. Since each feeder is fed from two circuit breakers even if fault occurs in one system the feeder can be fed from other system so there will be no interruption of power supply under fault conditions. 2.The effect of fault is localized to that section alone and the rest of the section continues to operate normally. 1. There will be difficulty to add any new circuit in the ring. 2. Over loading problems may occur. From the node point of mesh circuit is tapped. We need to open two circuit breakers when the fault occurs so that protection can be obtained but switching is not possible. 1. Provides protection against fault. 2. For substations having large number of circuits this arrangement is suitable. 1. It doesn't provide switching facility. 2. Not suitable for all type of substations. These are the different sub station layouts or bus bar arrangements. In this post we have learnt about electrical bus -bar and types of bus - bar arrangements and its advantages and disadvantages. To download this post on electrical bus -bar and types of bus - bar arrangements and its advantages and disadvantages as PDF click cntrl+p and save as PDF. The overhead line insulators provide insulation between the overhead line conductors and the earthed cross-arm to which they are connected and also provide support to the conductors.An ideal insulator should not allow leakage of current from the line conductor to the earthed cross-arm besides providing adequate clearance between the line conductors and metal work. 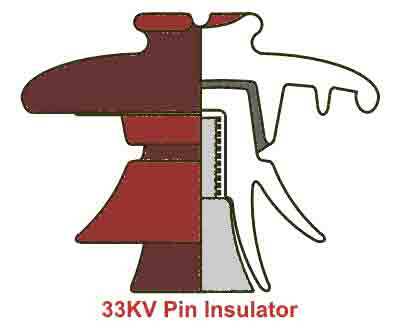 Pin type insulators are used for supporting line conductors.For low voltages up to and including 11 KV one piece insulators can be used and two piece insulators are commonly used for 25 KV and for 44 KV up to and including 66 KV three and four piece insulators can be employed.The pin type insulator figure shown in fig. Pin type insulator consists of single or multiple shells arranged in parallel and mounted on a cross-arm of the pole or tower.The designing of sheds or petticoats should be such that even when the outer surface is wet due to rain,the inner dry surface provides sufficient leakage resistance.On the top of the insulator the conductor bound into a groove,which is cemented on to a galvanized steel pin.A soft metal thimble is used to avoid the direct contact between the porcelain and the metal pin.The potential difference between the sheds can be increased by increasing distance between the sheds. 1.Pin type insulators are simple in construction and cheap in cost. 2.It provides economic and most efficient method of supporting conductors. 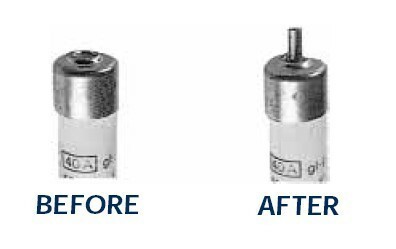 3.In many cases on pin type insulator is used instead of two suspension type insulators. For voltages below 50 KV,they give satisfactory performance ,beyond that,they become bulky and uneconomical. At high voltages pin type insulators becomes more bulky,cumbersome and uneconomical.In this case,suspension type insulators are used to insulate the high voltage transmission lines.Normally,these are used up to and including 400 KV .The suspension type insulators shown in fig. Suspension type insulators consists of porcelain discs arranged in series as shown fig.,by metal links to form a string.The conductor is suspected at its lower end and it's other end hangs from cross-arm of the supporting structure tower.Thw whole arrangement of a suspension type insulators are called as string(String Efficiency).The number of insulators in a string depends upon the working voltage,weather condition,size of insulation etc.,and if necessary,the discs to that string can be added easily. 1.If any one of the insulator in the string fails, only that insulator can be replaced instead of whole string. 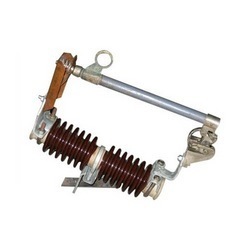 2.These are much cheaper in cost and used for operating voltages above 50 kV. 3. It gives more flexible operation and by this arrangement the mechanical stresses are reduced. 4. 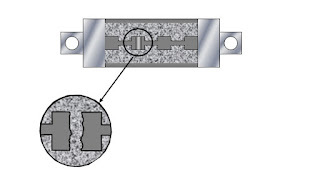 In suspension type insulator, additional insulation can be obtained by adding one or more discs to that string. 5.When these are used in conjunction with the steel towers, provides protection against lightening. 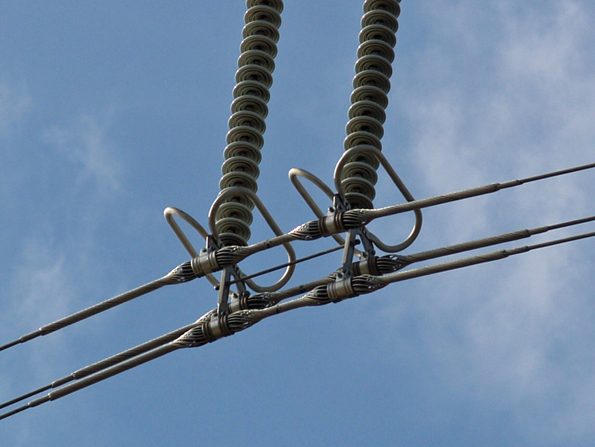 Strain type insulators are used when the line is subjected to greater tension such as dead ends,river crossings,sharp curves and when there is a change in the direction of line.The main function of this insulator is to reduce excessive tension on the line. It is basically an assembly of suspension insulator used in horizontal position as shown in figure. A strain insulator are designed with considerable good strength and with necessary dielectric properties. 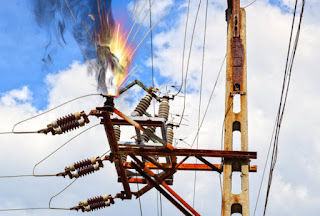 In case, when the tension is exceedingly high, two or more strings of insulator can be used in parallel.For voltages up to 11 KV,Shackle type insulator can be used.But for high voltages,strain type insulators should be used.strain type insulators also called as tension insulators. In addition to that there are other two types of electrical insulator available mainly for low voltage application, e.i. Stay Insulator and Shackle Insulator. Efficiency is a factor that defines the performance of any device or equipment. Generally, it is specified as the ratio of the output obtained to the input fed to a device. It suggests to what extent a device is utilized. In an overhead transmission line (OHTL) insulator, a number of insulator discs are arranged in a string in accordance with the operating voltage. The lowest disc or unit which is i near the power conductor experiences maximum stress or it is fully utilized. But, as we move towards the top most unit, the units are not heavily stressed and hence not fully utilized. Hence, the measure of utilization of the string gives string efficiency. Definition The string efficiency of an over head transmission line insulator is defined as the ratio of the voltage across the complete string to that of the product the number of units and the voltage across the unit nearest to the power conductor. n= No.of units in the string. It can also be defined as the ratio of the spark over voltage of the complete string to that of the product of the number of discs and the spark over voltage of one disc. String efficiency is an important factor as it suggests the overall potential distribution along the string of insulators. For obtaining uniform voltage distribution, the string efficiency should be as good as possible. if the distribution of voltage is uniform, then each disc will be fully and equally utilized. This also implies that, the discs in the string will experience equal stress so that the life of the string is enhanced. In ideal case, the string efficiency is maximum and the voltage distribution across each disc will be exactly the same. But in real time situation, it is impossible to achieve 100% string efficiency. Efforts' can be made to improve string efficiency. If the value of 'V (i.e., ratio of mutual capacitance to self capacitance) is decreased then the potential distribution is more uniform and string efficiency is increased. The non-uniformity in voltage distribution increases with the increase in number of discs in the string. Therefore, shorter string has more efficiency than the larger one.